Dragon dance (simplified Chinese: 舞龙; traditional Chinese: 舞龍; pinyin: wǔ lóng) is a form of traditional dance and performance in Chinese culture. Like the lion dance it is most often seen in festive celebrations. Many Chinese people often use the term “Descendants of the Dragon” (龍的傳人 or 龙的传人, lóng de chuán rén) as a sign of ethnic identity, as part of a trend started in the 1970s. Another derivation is from (農的傳人) i.e. the descendants of Shennong, the legendary first king of the Chinese people who taught them agriculture, law and medicine, the foundations of civilization. 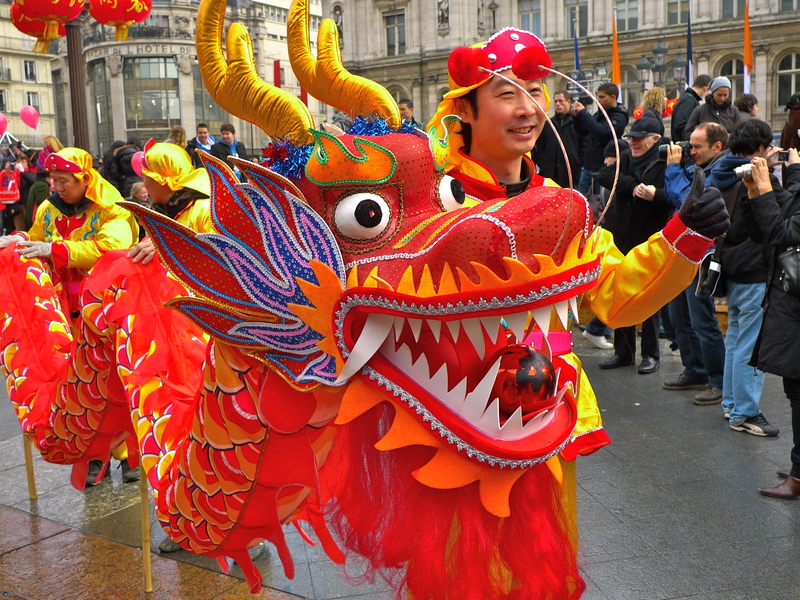 The dragon dance is a highlight of Chinese New Year celebrations held worldwide in Chinatowns around the world. Dragons are believed to bring good luck to people, which is reflected in their qualities that include great power, dignity, fertility, wisdom and auspiciousness. The Wushu Shaolin Productions team of professional Dragon Dance performers have demonstrated their unique talent around the world. Members are accepted from all over the world and work together during shows to provide clients with the most spectacular demonstration of traditional and modern forms of Chinese Dragon Dance. To book a show with Wushu Shaolin Productions please begin by filling out the form below. The automated system allows us to quickly and effectively manage all requests from international clients and prospective companies. To begin, please provide your name, organization, and company contacts below. Then select from the performance list to notify us which services you are most interested in. Dragon dance (simplified Chinese: 舞龙; traditional Chinese: 舞龍; pinyin: wǔ lóng) is a form of traditional dance and performance in Chinese culture. Like thelion dance it is most often seen in festive celebrations. The dance is performed by a team of dancers who manipulate a long flexible figure of a dragon using poles positioned at regular intervals along the length of the dragon. The dance team mimics the supposed movements of this river spirit in a sinuous, undulating manner. The dragon dance is often performed during Chinese New Year. Chinese dragons are a symbol of China, and they are believed to bring good luck to people, therefore the longer the dragon in the dance, the more luck it will bring to the community. The dragons are believed to possess qualities that include great power, dignity, fertility, wisdom and auspiciousness. The appearance of a dragon is both frightening and bold but it has a benevolent disposition, and so eventually became an emblem to represent imperial authority. 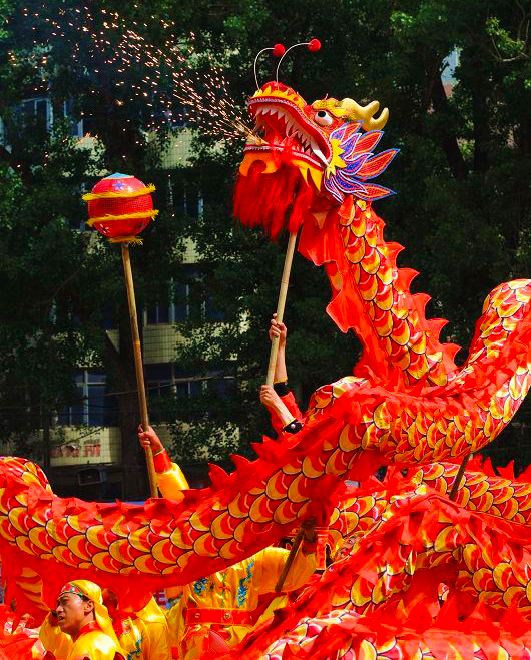 The movements in a performance traditionally symbolise historical roles of dragons demonstrating power and dignity. 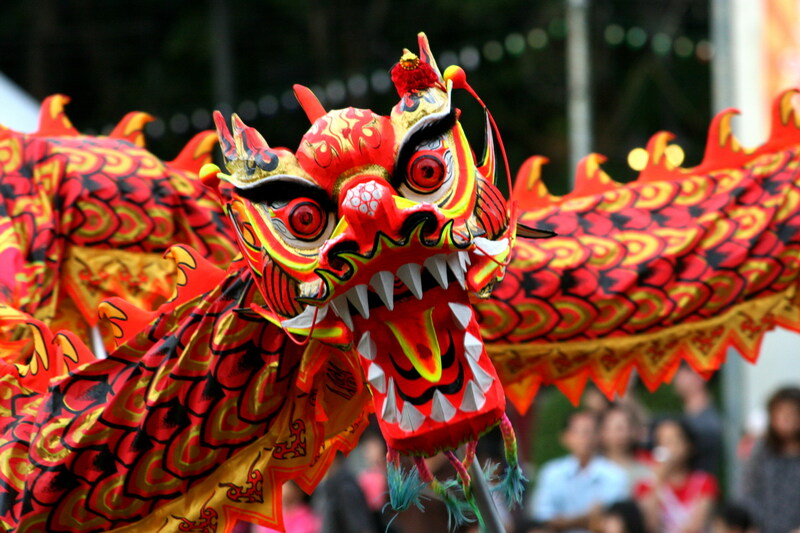 During the Han Dynasty, different forms of the dragon dance were mentioned. In ancient China, Chinese dragon was associated with rain, for example one dragon the Yinglong was considered the god of rain. Rain dance performed at times of drought may involve the use of figures of dragon. According to the Han Dynasty text Luxuriant Dew of the Spring and Autumn Annals by Dong Zhongshu, as part of a ritual to appeal for rain, clay figures of the dragons were made and children or adults may then perform a dance. The number of dragons, their length and colour, as well as the performers may vary according to the time of year. A popular form of entertainment during the Han Dynasty is the baixi (百戲) variety shows where performers called “mime people” (象人) may dressed up as various creatures such as beasts, fish and dragons. In his Lyric Essay on Western Capital (西京賦) Zhang Heng recorded various performances such as performers who dressed as a green dragon playing a flute, and a fish-dragon act where fish transformed into a dragon. Some of the performances are depicted in Han Dynasty stone relief engravings, and the props used appear to be cumbersome and do not resemble modern form of the dance whereby light-weight dragons are manipulated by performers. The dragon acts of the Han Dynasty were also mentioned in the Tang and Song Dynasty. Figures similar to the dragon lantern used during Lantern Festival were described in the Song Dynasty work Dreams of Splendor of the Eastern Capital, where figures of dragon were constructed out of grass and cloth and inside which numerous candle lights may be placed. Such dragon lanterns may be carried and paraded by performers in the street during the Lantern festival at night time. This may have evolved into the modern form of the dragon dance which is often performed during day time, it is however unclear when this current form of the dragon dance may have developed. A double dragon dance, rarely seen in Western exhibitions, involves two troupes of dancers intertwining the dragons. Even rarer are dances with the full array of nine dragons, since nine is a “perfect” number. Such dances involve large number of participants from various organizations, and are often only possible under the auspices of the greater community. The patterns of the dragon dance are choreographed according to the skills and experiences acquired by the performers. Some of the patterns of the dragon dance are “Cloud Cave”, “Whirlpool”, T’ai chi pattern, “threading the money”, “looking for pearl”, and “dragon encircling the pillar”. The movement “dragon chasing the pearl” shows that the dragon is continually in the pursuit of wisdom. The dragon moves in a wave-like pattern achieved by the co-ordinated swinging of each section in succession. Whilst this swinging constitutes the basic movement of the dragon, executing more complex formations is only limited by a team’s creativity. The patterns and tricks that are performed generally involve running into spiralled formations to make the dragon body turn and twist on itself. This causes performers to jump over or through the dragon’s body sections, adding to the visual display. Other advanced manoeuvres include various corkscrew-like rotating tricks and more acrobatic moves where the performers stand on each other’s legs and shoulders to increase the height of the dragon’s movements. 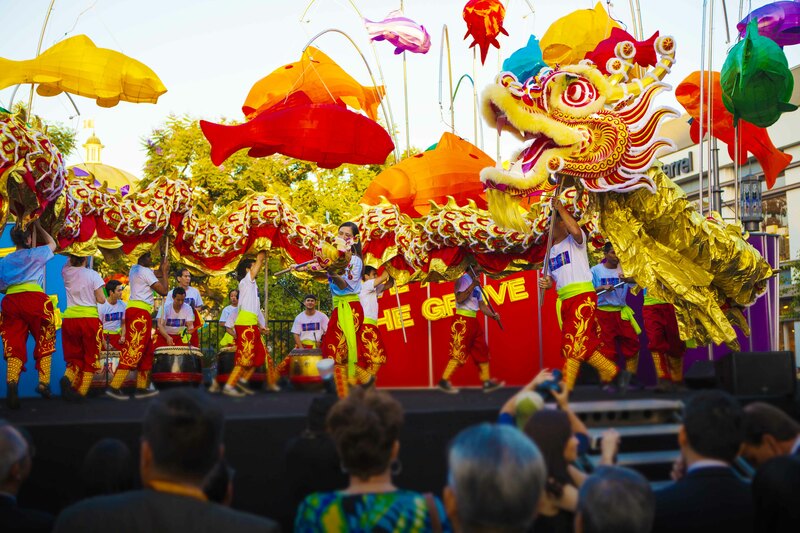 Do you have any lion dancers available for July 7th? Also add me to your mailing list.